After much excitement me and KPH finally got to see Mojo. We actually went on Thursday, but this week has been so crazy busy that I’ve only just had time to write anything down about it. First things first. If profanities bother you, then perhaps Mojo isn’t the play for you to go and see. I could say that there is some swearing, but more accurate would be that there are some normal words, connected into sentences by quite a lot of very bad words. 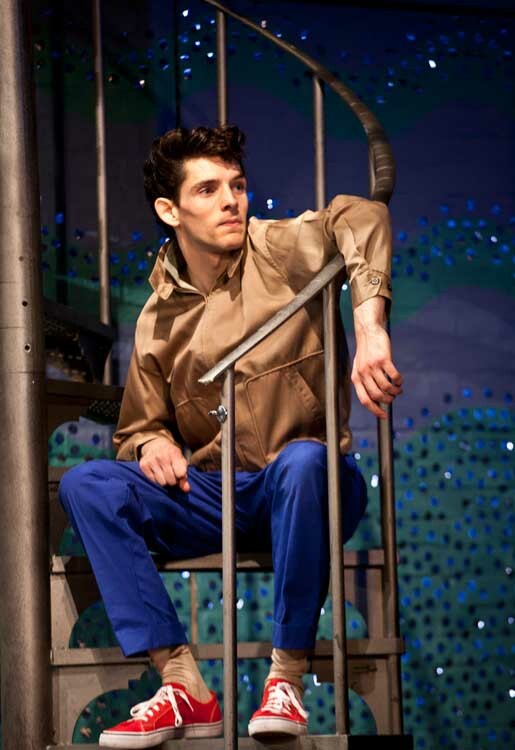 Secondly, you get to see Colin Morgan in his pants (that’s underpants, just to be clear). For quite a long time. Now, there has been many a daydreamed hour about witnessing that moment, but when faced with it from 3 rows off the stage and when it features some grubby fifties style Y-fronts, it’s rather off-putting. The subject matter is the blackest of comedy, and the ending of the play will leave you speechless, particularly the penultimate scene. 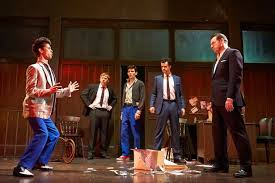 All the performances were typically amazing, though some were worthy of a mention: Rupert Grint in his first stage run was impressive and did a fantastic comic turn as Sweets, partnered with Daniel Mays who was manic, Ben Whishaw was suitably unhinged as Baby and Colin was a very twitchy, whiny club doorman called Skinny Luke. None of the characters were what you could call likeable, but the actors got this across perfectly. KPH and I both agreed that Baby was so horrid that you were actually glad when he wasn’t on stage, but that’s got to be a testament to the skill of the man playing him. There is so much I want to say about this play but can’t for fear of spoilers. The Harold Pinter theatre is small and intimate and has a sort of grunge feel all of its own that lends a great atmosphere to what’s happening on stage. This is not my favourite play that I have seen Colin in, probably because the era and subject matter don’t appeal to me personally, but I can appreciate that this is excellent stuff. We went to a matinee, and there was a sign up at the stage door saying that no photos with the actors were allowed after matinee performances. There wasn’t many of us waiting, and not many of the cast came out, so perhaps people already knew that they wouldn’t. Daniel Mays emerged, and I’ve never seen anyone run so fast from a stage door! We would have stopped him for an autograph but it didn’t seem like he wanted to be stopped (I will never ask someone who seems like they’re reluctant), although some people further up the road collared him. We came away from the stage door after while, as neither Colin nor Rupert came out, but as we were checking out the posters at the front door of the theatre, the guy who played Silver Johnny, Tom Rhys Harries, came up the street looking very relaxed and happy so stopped to talk to a few of us. He posed for a few illegal photos (naturally, I had to get one) and was really very adorable (cue fangirling as I go to investigate his other work), so all in all, I was glad we waited around. 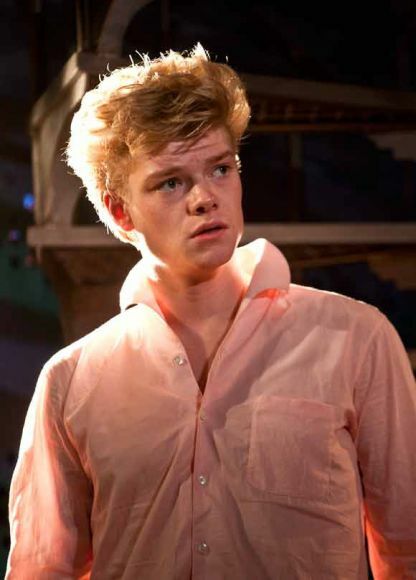 Someone asked him if Colin was coming out, and Tom said that he was sleeping, but as Colin has never emerged at any other matinee I’ve been to, and after seeing some of the photos of him being mobbed on the web, I wouldn’t be surprised to hear that he really just didn’t want to. Daughter 1 gets to see her first Shakespeare play and she loved it! Mister’s brother and Mister’s brother’s wife also came along – Mister’s brother’s second Shakespeare play in a week and also in his entire life! He loved it too. This was such a lavish production. 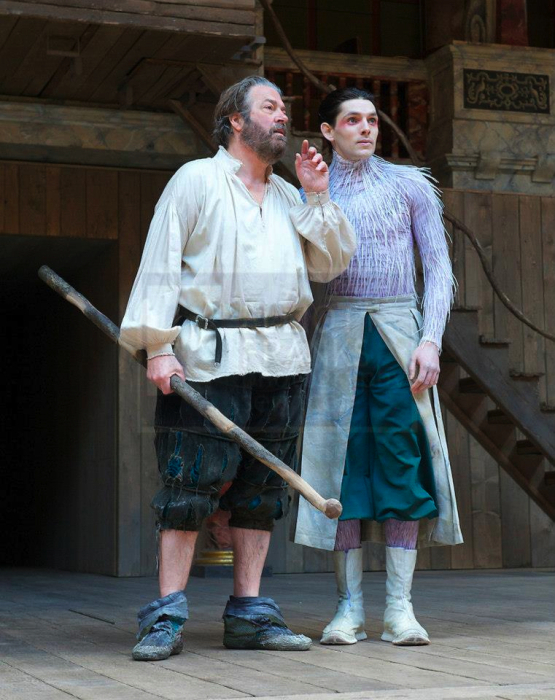 We seem to be on a run of Shaky at the moment – not deliberate but just how they’ve come along (next stop RSC for A Midsummer Night’s Dream in August). 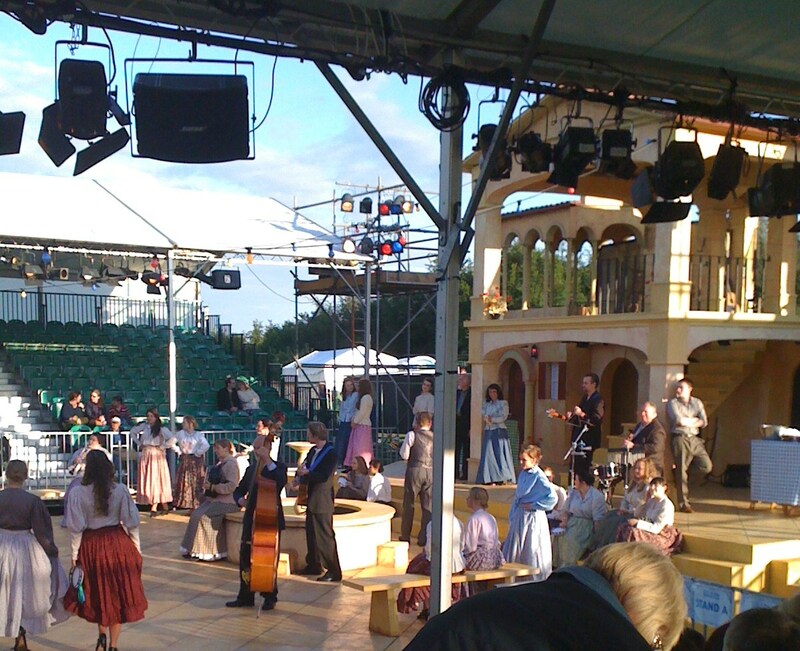 You could tell immediately from the quality of the staging and cast that the budget for this was much bigger than for Romeo and Juliet, which we saw a couple of days previously ‘al fresco’ at Trentham Gardens. But I digress. We loved the castle setting, it was like a posh little festival complete with food and bar tents and dodgy toilets. 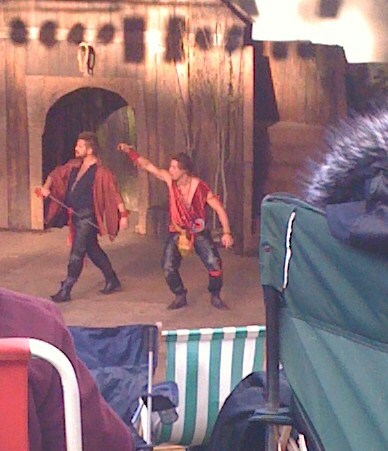 This was our first time at the Stafford Shakespeare festival. The woodland path leading up to the castle was strung with lights for the occasion so that when it went dark it felt like a journey into a fairyland. There was something just magical about it. Whoever made the decision to set the play in early 20th century Italy got it just right – the set and the costumes looked gorgeous and fitted well with that particular play. All the performances were faultless and the casting just right. If I’m honest, this was the first time I had seen this particular play and I wasn’t sure I’d like it (I usually go for the tragedies) but it was such fun and there was such a lovely atmosphere that you couldn’t help but get drawn into it. 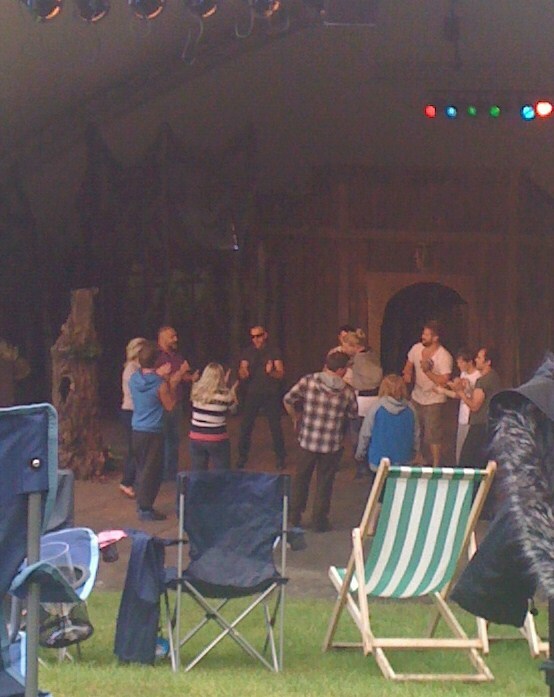 There was a pre-show, well, um…show, which was also really entertaining – loads of ladies in swishy skirts and men in swishy shirt sleeves playing folk songs, dancing with tambourines and telling jokes in fake Italian accents – just so cute. Daughter 1 – usually a thoroughly bored 21st century kid, completely lost her sense of not being bovvered and was dancing and clapping with everyone else with a massive grin. She also really enjoyed the actual play -I did wonder whether she would struggle with understanding it because of the language but it was so well performed and directed that it was easy to follow and she laughed along with everyone else in all the right places. The weather held for us, although it got very cold late on, but at least it didn’t rain. OK, so the weather report was a bit boring, I admit. It’s just that it’s quite difficult to be objective and critical about this production because it was all very lovely! 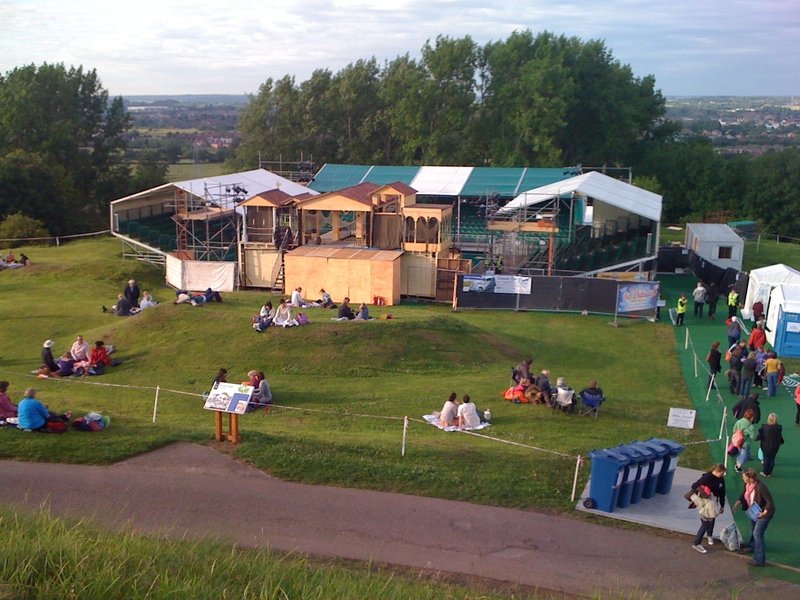 I had heard reports that the Stafford Shakespeare festival was under threat after poor attendances last year and, happily, this year being my first, I am glad to report that ticket sales had improved and it looks as though we’ll be able to go again next year. If you can get there, verily, I most heartily recommend it.